I was supposed to be on a business trip this week, but it was postponed to later in the year, so I ended up with some extra unexpected personal quiet time. Lizz watched after the greenhouses and I barely stepped a foot inside of them this week, which is completely unheard of, but was a nice change. I worked on some office work that needed finishing up, and of course, those kinds of projects are never really done, but the seed orders are finished and that is huge and a relief. Next, I’ll need to start updating the blog plant databases and work on creating the new plant Farm Stand information signs. M’lissa usually does this work for us, and she offered to do it again this year, but she is creating a new life in Montana, which is very exciting! 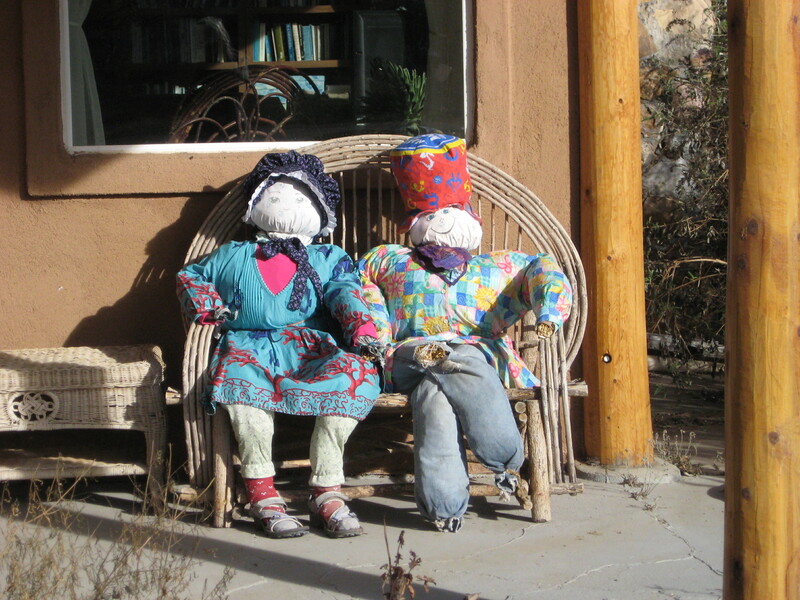 I did have time, FINALLY, to freshen up the scarecrows on the front porch. 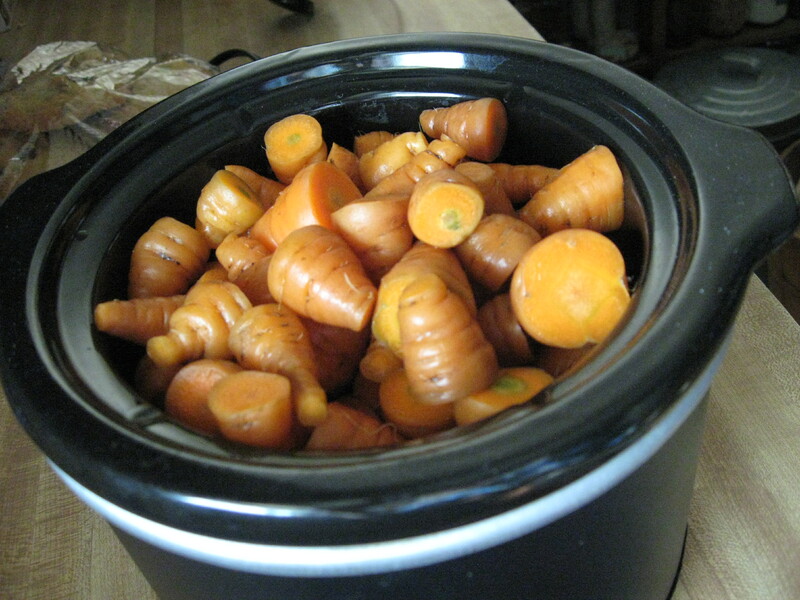 That was great fun and they look a lot more exciting now. The old scarecrows were pretty weary after all of the spring, summer and half of the fall seasons. 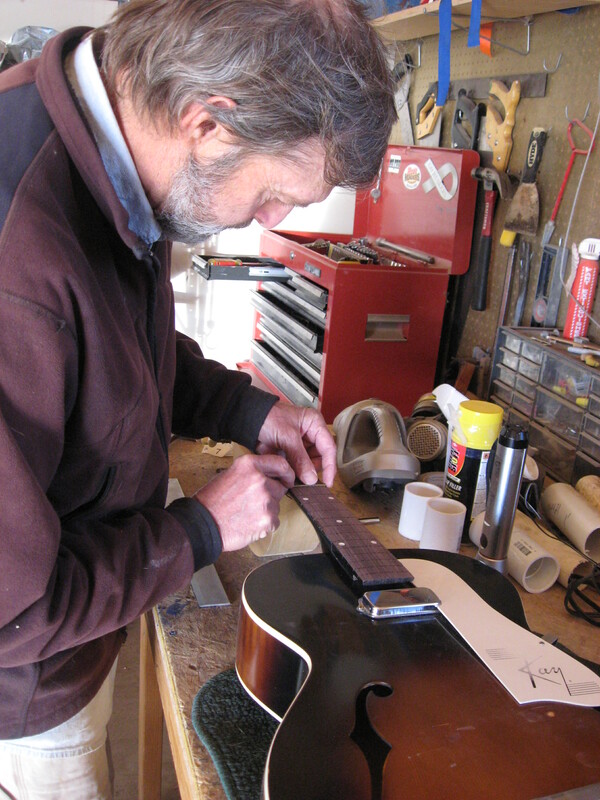 We got snow and it was cold for part of this week, which meant that Chris couldn’t do some of the farm work he had planned on doing, so he took advantage of his quiet time to work on re-building the neck on this vintage guitar. This guitar was mine and I got it when I was in the 6th grade and have played it through the years into my adult life, but a number of years ago I pretty much stopped playing it. I gifted it to Chris as he said it was the perfect guitar for a Dixiland band he plays in. I am a firm believer that instruments should not just sit around…they should be played, so I was very happy to hand this guitar into Chris’ care. The problem was that the neck was too thick to be easily played properly. 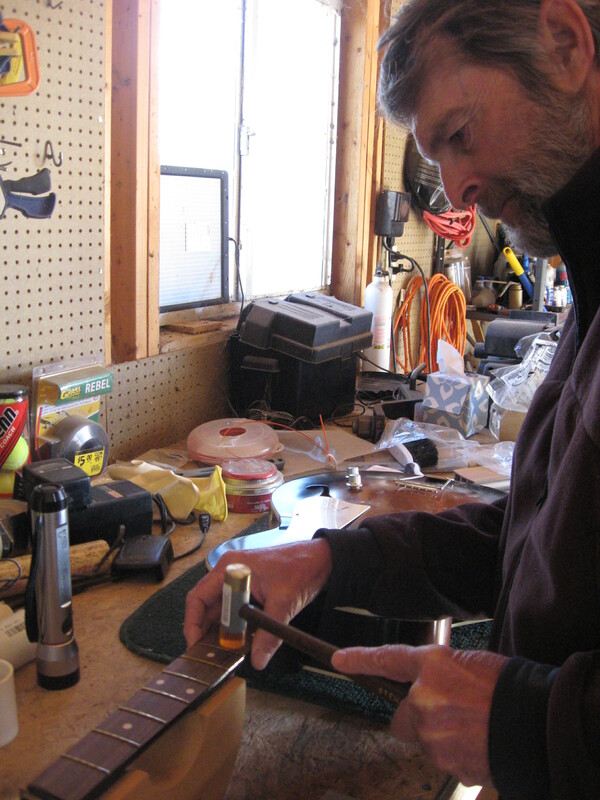 At one time, Chris was an apprentice Luthier. A Luthier is a person who builds and repairs string instruments. Chris really enjoys this work and thought at one time that it might be a second career for him later in life. His plans have changed about that, but he does still work on guitars when the need arises. 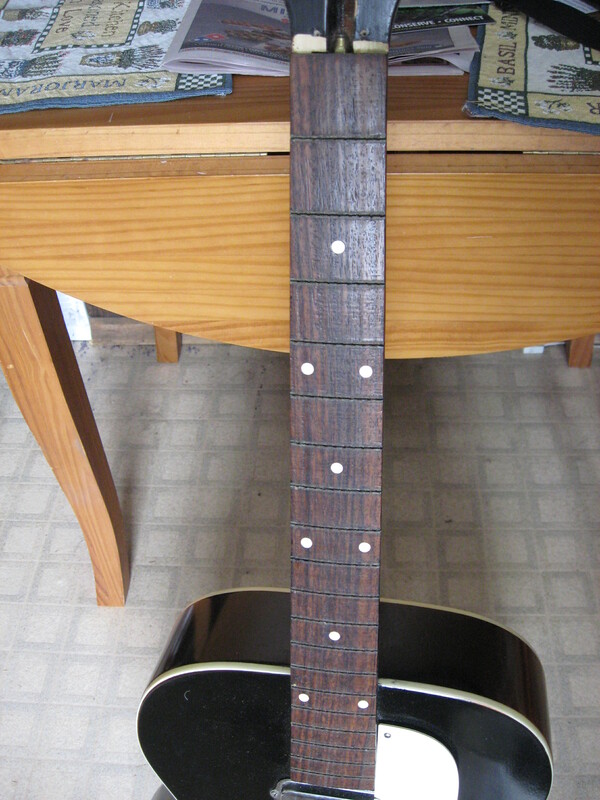 He rebuilt the neck on this guitar…everything from making the neck less thick so that it is easier to play, to repairing the top of the neck which was warped, and replacing the frets. My very old and much-loved guitar has a new life now and it sounds quite nice when played. The winter birds are starting to arrive at the farm in big numbers now. I’ve noticed that the juncos are showing up, as are the piñon jays in a massive-sized flock. 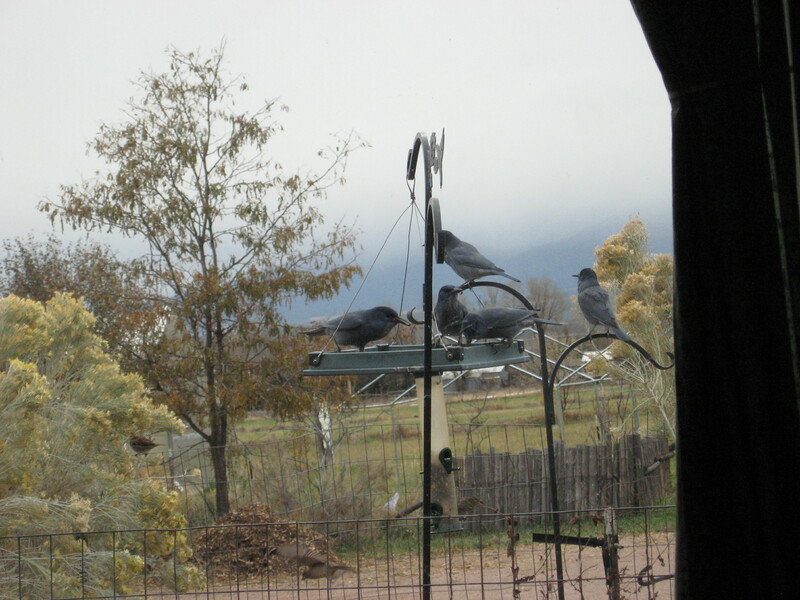 The piñon jays always arrive around mid-day, during the cold seasons of the year, looking for corn that I put out just for them. They eat their corn meal and off they go back to the juniper piñon pine forest that is about 10 minutes from the farm and where they live. It’s always interesting and fun to watch how the bird community shifts and changes with the seasons. Tomorrow begins a new work week, and I’ll be back to being busy again. Chris also has a lot of farm work he is hoping to accomplish this week. That said, I’ve enjoyed my quiet week. It was still productive, but in a relaxing way, and much appreciated. Thank you, Lizz, for making that possible.